JEGS Vacuum Canisters provide an extra shot of vacuum that new cams won't let you have to feed power brakes. Offered in steel (black or chrome) and billet aluminum (anodized or polished), these 5" x 7" canisters will not flex under load. Both styles include: grommet, one-way check valve, 90° fitting and a port plug. The Aluminum canisters feature the JEGS "Just-A-Ble" integral mounting bracket with stainless hardware. 63010 is rated 4.7 out of 5 by 35. Rated 5 out of 5 by Johnny Pipewrench from Great value! The big cam in my engine had my power brakes super stiff. I was having to stand on the brake pedal to stop, with 4 wheel disc brakes. This vacuum can did the trick! Pedal feels like it's supposed to now. Great quality and value for the price! I just needed a reasonably priced, simple solution, and this was it. Great service and fast shipping as usual from jegs. Rated 5 out of 5 by Jackie35 from Easy install I had bad brakes after installing a big cam in my sbc,problem solved with the vaccum canister. Rated 5 out of 5 by nkt7 from great Works as it should. especially if you have a bigger cam. Rated 5 out of 5 by Sikes185 from Great item I run a rather large cam and not much vacuum. This canister did just what I wanted. I have better power breaks now. Packaged well I like the black finish. Rated 5 out of 5 by Ronnie Mac from Quality Product Put this in a 427 SS Nova, help my brakes like it was suppose to, good quality material, good finish, looks like it belongs under the hood! Rated 5 out of 5 by Chris57chevy from Good quality Will be a good unit to work with my electric vacuum pump. Rated 5 out of 5 by this is wrong from Look's real nice! Haven't used it yet, but it should do the job, thanks. What size vacuum hose will I need and do you have it in stock ? This will use a 3/8&quot; vacuum hose for connection. You can look to see the expected delivery information just above the price on the web page. does it fit jeep 1997 wrangler ? 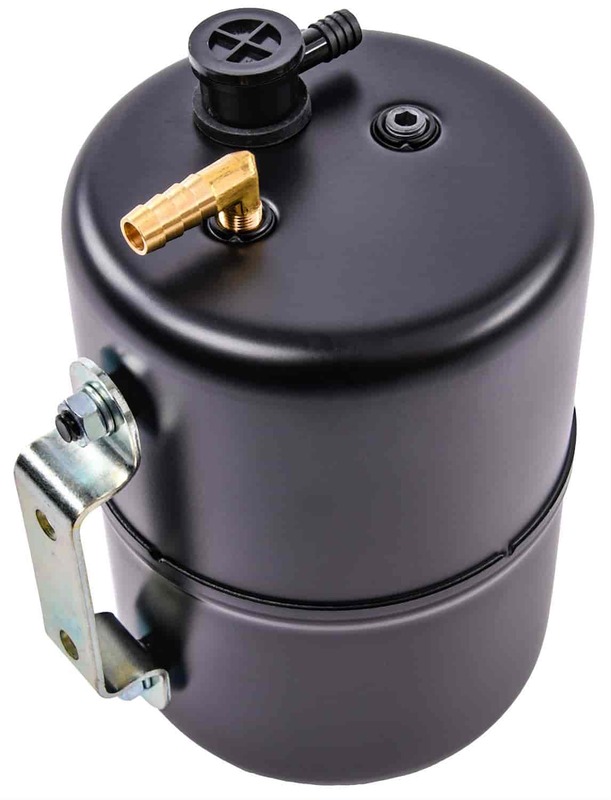 This is a universal vacuum tank and will fit all applications. Can this be used for the headlights on a 1969 charger. Vacuum canister is very similar. This is a universal vacuum canister and can be used for headlights. The black round plastic check valve is connected to the vacuum source.